Guttenberg Gallery exhibits and sells the work of local artists, and much of the pottery and glassware in the gallery were made in the upstairs Creativity Center. Below, find information about artists currently showing in the gallery. Living and working in Dubuque, Stormy continues to be inspired by the ever-changing marvel of Iowa's country. Having been an Iowan all her life, it seems natural that each of her images contain a little piece of country: Farm houses, starry skies, chickens and birds. "Art is my release from a world of serious things. It is my connection with my inner child, my playful, not-so-serious self. My images are simple: Stars, flowers, people. Things that make me stop and notice, things that make me happy: Brilliant colors, coloring book-like outlines, scribbles, and stitching. Free flow writing is often present in my work. The writing is thought turned to form, only to be seen, not meant to be read. My ideas and images come from all the life that surrounds me, although my imagination tries to take most of the credit. Ketaki is a visual designer by profession and an aspiring contemporary artist, coming from a line of creatives in her family. She holds a Bachelor in Fine Arts Degree from Sir. J. J. School of Arts, Mumbai, India and Masters in Fine Art from Academy of Art University, San Francisco, California. She was born and raised in Mumbai, India. While pursuing MFA she met her husband and in early 2017 they moved to Elkader, Iowa to pursue something greater and passionate. Now she is entirely dedicated to the creation of contemporary art and is starting an independent design agency called Studio K8Ki specializing in branding, web design and illustration. Her work is influenced by Impressionism and Modernism. She started her fine art journey with oil paints but over the years have prefered acrylic paints more. You will see use of bold colors in her paintings. Check out more of her work at Studio K8Ki. Natalie was born in Dubuque, Iowa to Dr. James and Ramona Heiring, the fifth child of ten children. Natalie received her elementary education at St. Clement’s School in Lancaster, Wisconsin. She showed an early interest in art; often completing art assignments her father would challenge her with as he worked on his own art projects. Her formal art education started at St. Mary’s Academy in Nauvoo, Illinois under the guidance of Sr. Veronica Schunick, OSB. After receiving her high school diploma, she entered St. Ambrose University in Davenport, Iowa, majoring in Art Education. Recently, she has received her Master’s from Morningside College in Professional Education. She has taught art students at Sts. Peter and Paul Elementary in Nauvoo, Illinois; Marquette schools in West Point, Iowa; Southeastern Jr. High in Bowen, Illinois; Prairie du Chien schools and MFL Mar Mac Schools in McGregor, Iowa. She recently taught classes and ran an art gallery at The Lamp Post Inn & Gallery in McGregor, Iowa. She also teaches art classes and adults at MFL Mar Mac School in the evenings. When she was an elementary student the Union Bank and Trust of Lancaster, Wisconsin in the firm’s advertising first published her artwork. Most recently she has displayed work at art fairs in Illinois, Wisconsin and Iowa. Recently she has completed work for the Carriage Classic and the Taste, Toast and Tomfoolery Gala in Prairie du Chien, Wisconsin. She has also displayed work at art galleries in Illinois, Iowa, Missouri and Wisconsin. Currently, she has work being displayed at The Planted Tree in Prairie du Chien, Wisconsin, Frannie B & B and Convention Center in Dubuque, Iowa and Guttenberg Gallery and Creativity Center in Guttenberg, Iowa. Artist Statement: "My inspiration comes from what I know best; the Midwest with its barns, grain elevators, covered bridges, windmills and other rural treasures that are disappearing from our land. I paint them with a different flair of color that gives then a life of their own. I tend to simplify my subjects and infuse them with bright and fresh colors. The resulting intensity and richness convey my delight in painting and desire to express something that most might not actually see. Starting with a sound composition or structure, it then becomes a work of contrasts---light against dark; warm against cool; sharp against soft and rough against smooth. This along with the immediacy and intensity of the watercolor medium makes painting both challenging and enjoyable. My hope is that the viewer will experience something familiar in a new way!" Beth Gilana moved to Northeast Iowa in February of 2017 with her husband Isaac, who is the pastor of Calvary Bible Church in Volga, IA. Beth has always enjoyed art and chose art over choir and band in Junior High. She has always loved color and design and has dabbled in photography. In 2014 Beth was living in Wheaton, IL and decided to take watercolor classes at the DuPage Art League. One teacher was a very exact watercolor artist and the other painted in very broad and sporadic strokes so Beth feels she got a very balanced start into watercolor. After those two classes Beth fell in love with the watercolor medium and eventually began to stretch her own watercolor canvases (something she learned from YouTube). In fact, tutorials on YouTube and books from the local library have been Beth’s teachers as she works to grow in her ability to make great pieces of art. Beth loves nature and so much of her artwork is inspired by God’s amazing creation. Many say her work looks “happy”. The colors and subjects reflect her view of the world - God is at work and so there is always hope! Melissa Spielbauer-Combs grew up in the small community of Osterdock, Iowa and now lives in rural Petersburg. She began taking photos over a decade ago for her work at The Guttenberg Press, and when she became the reporter for the Colesburg news in 2016, she upgraded her camera. Since then she has found herself exploring and taking more photos than ever before. "I find joy in traveling through Delaware and Clayton county, looking for wildlife. I do a lot of travel in these two counties because I travel to work, and to my parents home in Osterdock, so I am familiar with some scenic areas. I like glancing around to see what I can catch on camera. Wildlife is interesting; wildlife don’t pose long if they do decide to pose. Quick, steady fingers help and when the photo is printed or developed sometimes there are surprises - something that you did not notice when taking it. It is exactly how the saying goes: a captured moment. "I like nature. It is simple, it is real, it is what you see, to me it is beauty. Whether the animal is young, or old, I think it is important to show people these photos. Perhaps people will learn to appreciate nature more, or just learn more about nature." Melissa's wildlife photography is often featured in The Guttenberg Press, shared with captions that she hopes will help people look at nature from a new perspective - like the woodland sunflower, pictured above. "Not just pioneers but many Native Americans used plants: Wildflowers for medicine, and food, and one of the uses for sunflowers was seeds for oil in cooking. A tea was also made from the roots of the plant for purpose of medicine," said the artist. I grew up on a dairy farm in the hills of northeast Iowa, and I was always in love with the beautiful scenery around me. I could go find beauty elsewhere, but I always had that pull to come back home. I loved my family, the landscape, and the close-knit community. Needless to say, I never stayed away for long. Now, I’m raising my own family in these same hills! I started painting because I wanted to share the beauties of this world with others. Whether it is a vacation you were on or the countryside where you grew up, I hope my art brings wonderful feelings to your heart and intrigues you. I hope it pulls you in and allows you to “get lost” for a moment or two. As an artist, I love to play with color – maybe that’s because I see things differently through my eyes. Many times, when I look back at photos, they just don’t do the original scene justice. I strive to make my paintings have that extra flair that brings out the true beauty of a subject and really relays how I felt in a given moment. Over the years, I have painted many different subjects and have challenged myself to convey a feeling in each individual painting. My current passion is landscape art, and my first full series is going to be an “Eastern Iowa” series – the farms, landscapes, and the fog on the river that I always loved seeing as I rode the bus to school. I am also working on an “On the Water” series, the first of which is “Horseshoe Bay” – a painting of sailboats that I was inspired to create after a trip to Door County, Wisconsin. Steve Mineck, Cedar Rapids native now residing in rural Vinton, Iowa, is Guttenberg Gallery's first glass blower. His interest in blowing glass began many years ago after observing a glass blower at an art festival in Madison, Wisconsin. Over a decade ago, Steve made the decision to pursue glass blowing on a more full time basis. Steve’s “formal” education in glass blowing was rather limited. He attended a two-week art program where he received instruction from University of Wisconsin art professor Jim Engbritsen. Steve then participated in Kirkwood Community College’s glass art program for two semesters. 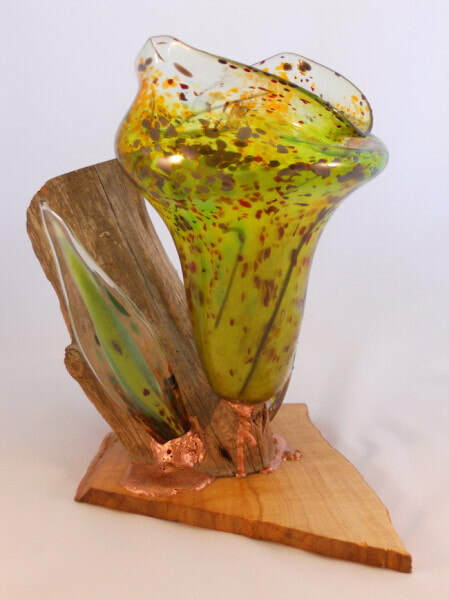 Since there were no glass studios or opportunities to work with experienced artists in eastern Iowa, Steve read and observed to further his knowledge and skills in glass art. Financial constraints dictated that his shop and equipment would be mostly designed and built by him. Once the shop was complete, Steve was able to begin honing skills and expressing his vision in glass. Jillian holds a Bachelor of Fine Arts Degree from the University of Northern Carolina at Chapel Hill. Her work has been influenced by Hans Hofmann, Edvard Munch, Robert Rauschenberg, Mark Rothko, Vincent Van Gogh, and many others. Jillian was born and raised in North Carolina, but now resides with her husband and newborn daughter in St. Olaf. She says, "I had reservations about moving so far from the coast, but I felt an immediate connection to the rolling hills of northeast Iowa; the waves of grain and dramatic horizon line actually mimic the beachy landscapes and rolling hills of my childhood." Stop by the gallery to view these and more works from Jillian! Watercolorist Cindy Lynch volunteers, teaches classes, and still finds time to paint. Much of her work is inspired by river and beach landscapes and color. I am a resident of Solon Iowa. While creating jewelry, color and texture are two words that wind their way through my work. When creating pieces I may let the color of the material stand on its, own with wire and connectors kept simple to take back stage. In other pieces, the weaving pattern will add more interest to the stone and glass or may let the wire take center stage and the color give the accent. Mixing soft and hard textures together enables them to share the spotlight and enhance each other's qualities. Each piece starts with a plan but often the materials have a different idea. This is especially true of the more complex pieces. The design will evolve as work progresses, and if I listen to what the materials are telling me the results will be very satisfying. A successful design for me creates visual interest as well as a desire to touch and feel the textures. It is a supreme complement if you want to touch the piece. I am an artist, a woodland steward, and a story teller. A tree responding to water, air, light, and earth is a sustaining element in my work. I am influenced by how trees live. My primary artistic medium is ink wash on paper. I splash, flood, and brush pigment over the surface. Suggesting mystery in the imagery is as important as introducing detail. Each viewing provides unique experience. I was born in Casper, Wyoming and lived my early years in the Wind River Basin. My father worked on the oil pipe line so our family moved often. In 1970 I graduated high school near St. Louis, Missouri and was drafted in the Army to serve with NATO in Europe. During the two years of active duty I was introduced to and began a lifelong pursuit of art. This has taken me around the world adding up many adventures. Currently my wife and I operate Point of View Bed and Breakfast in Harpers Ferry. I have enjoyed photography for my entire life. Begining in about 6th grade my dad had a darkroom and let me help in the darkroom and take pictures, and I have taken photos ever since. First with a Kodak Brownie of my Dad's, then my first camera, a 127 Kodak, next with a Contina, range finder 35mm, followed by my first digital, a Minolta 7i , then in 2010, with my current camera a Nikon D90. We enjoy woodworking (design & build),hiking, camping,and am finally finding time to travel. I am also going back to photography as I mature in my life. I go thru life day by day seeing things that have a call to me, beautiful things,special things, meaningful things, ordinary things in a different setting, that I would like to capture and preserve for others to see. So I take photographs. I see a person, thing, or scene and I think, that would make a beautiful photograph, and then it's my job to try to capture what I am seeing with my eyes. Sometimes I can. Sometimes the light, the scope, the beauty I see, can not be captured, even with today's technology, but I have to try. I don't have a specialty, and take photographs of many different subjects, in all types of categories. and find beauty in many things... I do some processing in Lightroom and Photoshop, but not to destroy the photograph with overprocessing. HDR is the latest fad and I have experimented with that, to the extent we can get expanded light or depth of field range I use it sparingly, not making every photo surreal, not claiming a photograph is not HDR when it is.To me HDR is a dIfferent medium. I am sometimes torn between color and black and white, I like a beautiful colorful scene, but it seems for some photos black & white makes a person see the subject itself without the distraction of color and that is good too. Susan Leonhart is a retired elementary teacher who currently lives in Guttenberg, IA. She loved teaching art in her classroom for thirty-five years and continues to love creative challenges and learning. Currently she is a glass fuser and enthusiast; fascinated by color, shape and design. When creating a new piece she will lay out many colors and textures to see what ideas come to her. Susan views glass as an amazing media, and the potential seems limitless. Steve Takes grew up in Cascade, Iowa. He currently lives in Mt. Vernon, Iowa. After high school, he studied art at The Minneapolis College of Art and Design for 2 years, then moved to Massachusetts and studied theater for 2 years. His many moves since then have taken him to various cities throughout New England; Baltimore, MD; back to Minneapolis; and finally "full circle" with a move back to Iowa. His many years in the design industry have helped to keep his creativity flowing, and when the spirit moves him, he channels his extra energy into his paintings! Whether it's whimsical or thought-provoking, Steve's art is designed to uplift the spirit. It is his intention to join the forces of good in creating a better planet, and to spread smiles and joyful feelings across the world! Liza is a self-taught visual artist and designer born and raised in South Africa and now living in McGregor, IA. 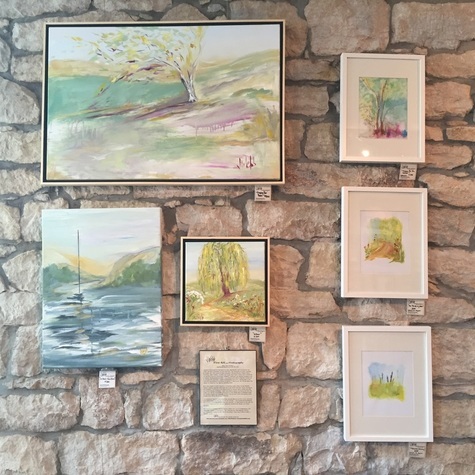 For the past 23 yars she has exhibited and sold her artwork and designs traveling and living in England, Scotland, South Africa and Australia. Liza is deeply passionate about what she creates; all of her work is derived from her imagination, Universal Consciousness and the natural world. Her mediums include print making, etching, wax sculpture for centrifugal/lost wax casting (for jewlery designs), murals, watercolors, acrylics and mixed media collage. "My art expresses images rich in archetypal meaning, drawing on mythological, multi-cultural and dream inspired themes. My main artistic influences include Art Nouveau, Art Deco, Symbolism and Magical Realism." Gina Dahlstrom-Osburn's love for everything jewelry started early. Her grandparents owned a jewelry store in Guttenberg and she grew up learning the differences in stones. Her mother and grandmother taught her to repurpose and think creatively. Gina's jewelry reflects her tendency to be a free spirit. Tom and Diane Friedman live and work together in rural Guttenberg. The couple took a stained glass together in the 1980s, and have spent the decades since creating high- quality, one-of-a-kind glass pieces for the home. Gail holds an MFA degree in Theatrical Design from the University of Wisconsin and has worked in design and technical theatre for 20 years. Now retired and living in the beautiful bluff country surrounded by prairie meadows that provide an endless sources of inspiration. Gail paints in watercolor and acrylic but primarily works in collage. She prefers to re-use and recycle "assorted bits and pieces of this and that" found in all kinds of intriguing places. You may find artist Laura Manson volunteering her time upstairs in the Creativity Center, where she dyes scarves and creates beautiful fused glass pieces. She also spends her time creatively outside the studio, making jewelry or clipboards like the ones for sale in the gallery. Molly Moser, a graduate of The University of Iowa, makes her home in Guttenberg. 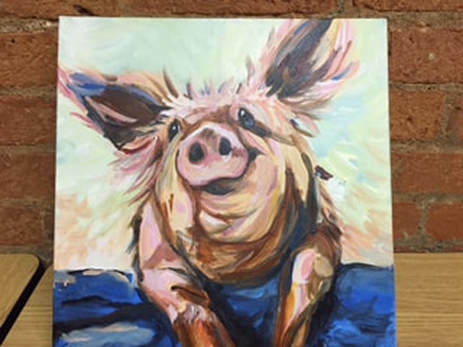 Molly’s paintings explore the relationships, emotions and interactions that occur between families, friends and partners, humans and nature. She creates interior spaces to tell these stories through the personal objects they contain. View her work at www.mollymmoser.com. 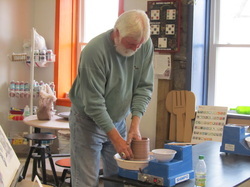 Steve Solomon returned to the potter's wheel when his wife, Cindy Olsen, founded Shepherd Gallery and Creativity Center. Steve is the Gallery's resident potter, creating many of the ceramic pieces found on our shelves. He can often be seen upstairs “playing in the mud,” loading and unloading kilns, or doing other odd jobs around the building. Guttenberg native Pockey Weseman was a carpenter all his working life. In retirement, he began making intricate wooden checkerboards. The artist uses four varieties of wood in each checkerboard, inlaid with delicate pieces of walnut, maple, cherry, and oak. Each board comes with a set of checkers, made in opposing wood tones. Weseman says he makes 6-10 boards at a time using an assembly line process.